Discussion in 'Videocards - NVIDIA GeForce Drivers Section' started by Mott, Dec 10, 2017. 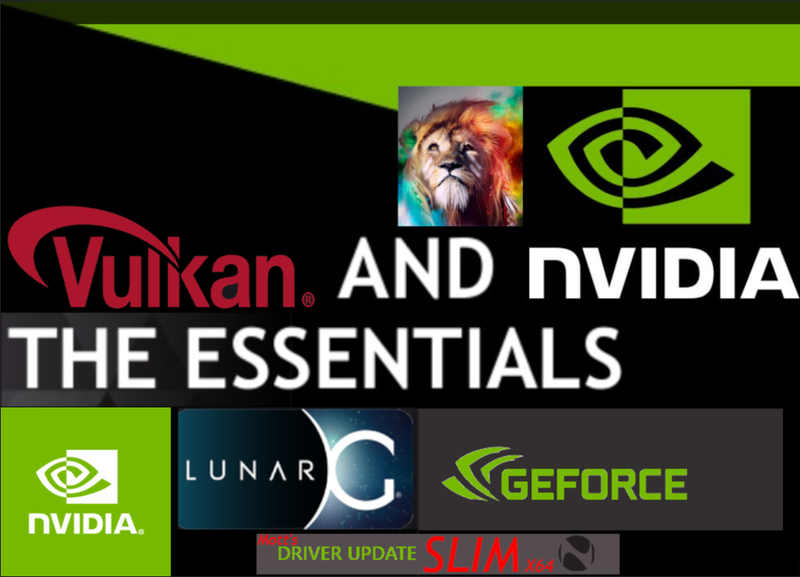 Download Vulkan SLIM RTX add-on here. The latest Vulkan RT is usually not available with the latest nVidia drivers. While if the newest RT is not technically supported by the latest nVidia driver, installing the newest RT will gain you the latest bug fixes. Having the latest RT installed, even if not running the nVidia Vulkan specific drivers, will always be of benefit. cryohellinc, AQUILES, holystarlight and 12 others like this. vulkan RT is already in the "Display.driver" folder that already exist in the three method of installation according to your pic "you can't delete this folder anyway" so why upload it again or do i miss anything ?? EDIT: The best answer to this is that the latest Vulkan RT is usually not available with the latest nVidia drivers. While if the newest RT is not technically supported by the latest nVidia driver, installing the newest RT will gain you the latest bug fixes. So, having the latest RT installed will always be of benefit. Old Answer: Because it won't install it unless you install the driver straight from the original package or you do it yourself. I don't run the original installer as I unpack it and install what I want so nVidia doesn't install the Vulkan drivers. I didn't realize this until the other day. Just trying to help some people out. Hmm, I've been doing this forever now and vulkan is installed every single time. -Tj-, Vidik and norton like this. Because it won't install it unless you with install the driver straight from the original package or you do it yourself. I don't run the original installer as I unpack it and install what I want so nVidia doesn't install the Vulkan drivers. I didn't realize this until the other day. Just trying to help some people out. Strange as I do the same but didn't have Vulkan installed so I had to seek it out myself to get the new Wolfenstein to work. pegasus1, Lilith, AsiJu and 1 other person like this. Because that's the API version the current Nvidia driver supports. The current driver doesn't support Vulkan features higher than 1.0.56 even if you install a higher version of the Vulkan Runtime. dr_rus and norton like this. 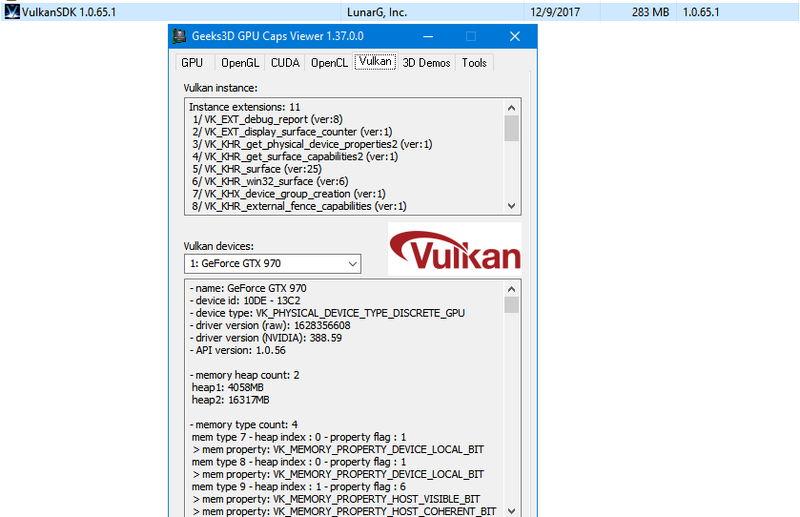 Vulkan Runtime Libraries 1.0.65.0 up to date from the nVidia Win 10 390.65 x64 driver. I also added 390.65 Win 10 x64 desktop minimalistic package pre-made in rar format. Sorry to say OP but you got two things wrong, one, the latest version is 1.0.65.1, and two, Vulkan IS installing, but since a few versions ago it is intentionally not shown in the installed programs list. I think the official runtime does that too, although come to think of it I never stripped out the 1.0.65.1 ones from the full SDK though it's just some smaller fixes to the installer itself as I remember from the changelog and nothing for the Vulkan loader or .dll files. It can still be seen via something like CCleaner or you can just go to the C:\ Program Files folder and the Vulkan sub folders and run the uninstaller from there to remove it, which I tend to do since this system uses the Highlander rules and there can only be one. All I know is that Wolfenstein 2 wouldn't run until I manually installed Vulkan because it was not recognising it as installed. I thought I would put it up here for people in case they ever need it. Also, no you are wrong. Extract the driver and look in the display.driver folder. nVidia provides 1.0.65.0 not 1.0.65.1. I am providing the one nVidia provides with their driver not from any other source. If you install the VulkanRT from the nVidia driver it will show up in your program files as that version. For me it installed, Wolfenstein 2 worked . but I can't see the Vulkan Installer in Add/Remove programs. but all the DLLs are in System32 and SysWOW64 weird. Updated OP with 390.77 "Free of Crap" package and the latest version of Vulkan that came with the drivers (still the same version but I changed it out nevertheless). The official runtime is in the SDK package. You can replace the one in the nvidia folder with this one (keep the name Nvidia uses). I'd delete the HD Audio folder unless you're playing through TV speakers (eww) and the PhysX folder as well since it's pretty much dead and eats FPS on the older games it runs on. I like to use the latest nVidia approved version of Vulkan, don't need the SDK as I am not a developer (which is why I install the latest run-time - not the SDK, and I do use the TV speakers when I play couch games with my friends as I have 6 controllers; we play multiplayer games on the TV a lot. As for the PhysX I am pretty sure a lot of games still use it and will continue to install it unless you can point me somewhere that I can read about your claims. It was same with Intel drivers. After Installations of nvidia and intel drivers, i was ending up with two different vulkan runtimes all the time. Thats probably why they gave up with this and from some time i have no entry in Programs and Features. Games and vulkan demos works anyway. So it must be that runtime is installed anyway, just few dll in system folders or so, like with ocl. Normally when you install Vulkan run times, it copies "nv-vk64.json" and "nvoglv64.dll" (I can't check the name of this one from here) and the 32 bit versions to "/Windows/system32/" and then sets the registry in "HKEY_LOCAL_MACHINE \ SOFTWARE \ Khronos \ Vulkan \ Drivers" to have a dword named as the path to the json file. While there is this problem with installing Vulkan, it's sufficient, rather than manually copying files to system32, just to point to the json in the driverstore folder in "HKEY_LOCAL_MACHINE \ SOFTWARE \ Khronos \ Vulkan \ Drivers". The json points to the folder it is stored in for the required dll files, and the correct files are beside it in the driverstore. But in case there is variation in the folder in the driverstore, check in "/windows/system32/driverstore /" for the location of the json file in the newest driver folder,and confirm its in the registry. Oh but after setting the location in registry, you need to reboot or run vulkaninfo.exe which is in a sub folder in "/program files (x86)/Vulkan RT/". Them Vulkan should correctly appear in RPCS3.